In the past two decades, NASA spacecraft have identified potentially habitable environments throughout the solar system and beyond. Spacecraft on Mars have found evidence that lakes and streams once covered the planet, protected by a long-gone thick atmosphere. At Saturn's moon Enceladus, the Cassini spacecraft sniffed plumes of water jetting out of Enceladus's icy shell—detecting chemistry akin to that occurring in certain places on Earth's seafloor, where seawater chemically reacts with rock (and where living creatures thrive). The upcoming Europa Clipper mission could do the same at Jupiter's moon Europa, where scientists have spotted more plumes. Even beyond the solar system, some of the thousands of planets now known to orbit other stars may harbor surface oceans. The next step in exploring these environments is to find out whether they're actually habitable—and then search for life. Unfortunately, no simple life-detection instrument currently exists. Unless a camera captures a growing mat of bacteria on a Martian rock or alien plankton swimming under Enceladus's ice, scientists must use a suite of instruments and diverse sets of data to look for biosigatures—or signs of life. But what are those signs? To help answer this question, a team from NASA's Astrobiology Program has developed the "Ladder of Life Detection," a guide for researchers where each rung represents a key attribute of life. The Ladder was published in the journal Astrobiology on June 4, 2018. 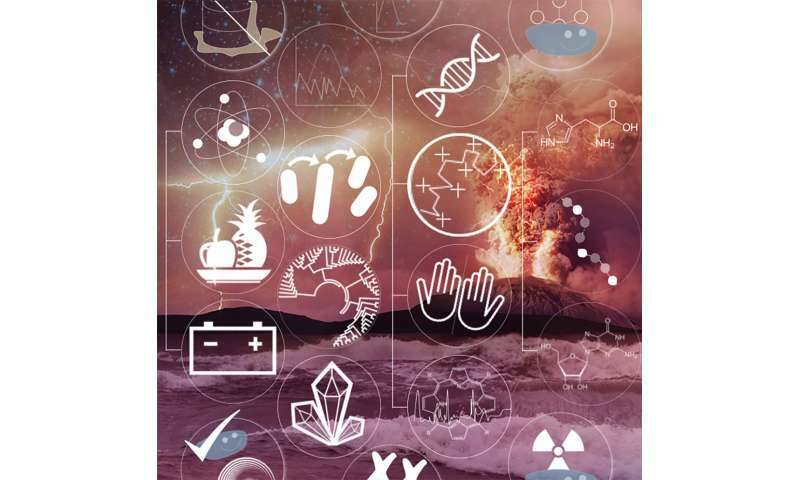 "The Ladder of Life Detection lists 15 features that the astrobiology community proposed to represent indicators of life," said Marc Neveu, a postdoctoral fellow at NASA Headquarters in Washington, DC and lead author of the paper. The Ladder also describes how scientists might measure these features and determine whether they really are evidence of life. But just finding these molecules doesn't mean they arose from life. "Many of the molecules that are used by life can be formed without life," said Mary Voytek, Senior Scientist for Astrobiology at NASA Headquarters and paper coauthor. For example, chemical reactions on a planet or comet can form amino acids and other organic molecules. Scientists have to "figure out, with those caveats, how you can say that what you're looking at was produced by life," Voytek said. An indication would be target molecules found in unique proportions compared to expected levels in the surrounding environment. "The presence of something that's not predicted in the environment is evidence of life," Voytek said. "Life pushes things out of equilibrium." For instance, organic molecules of a certain complexity (think a Lego car versus individual bricks clicked together) could only have been made by life, Voytek continued. "Chemical complexity is a result of biology—it requires energy or enzymes to make it happen." Other biosignatures include pigments, indications of metabolism (e.g., waste heat or compounds breathed out by life), or even evidence of Darwinian evolution. The latter can't currently be detected within the timescales of a space mission, but would be the golden ticket to identifying life. Whether scientists can measure these biosignatures, either remotely or in place, is the next question, Voytek said. It's not just about instrument performance or avoiding the contamination of samples with molecules brought from Earth. Scientists will also need to consider the environmental context. How fragile is the sample? Can our analysis destroy the sample? Does the environment chemically change the sample? Can life tolerate the conditions where the sample came from (like the radiation-exposed surface of Mars or the cold depths of an ocean under ice)? The Ladder lists answers for each biosignature, based on experience gained by looking for life on Mars and in Earth's oldest rocks and most extreme environments. As it turns out, easier measurements to make (the bottom rungs) might be harder to interpret than rungs further up the Ladder. Climbing the Ladder toward life will require challenging measurements. Neveu stressed that the rungs on the Ladder aren't set in stone—with more research and discussion, each step of the Ladder can be moved around, and more can be added. He and his coauthors encourage input from the astrobiology community to improve the Ladder. "Spacecraft on Mars have found evidence that lakes and streams once covered the planet, protected by a long-gone thick atmosphere." Stories for toddlers without any evidence. "At Enceladus, the Cassini spacecraft sniffed plumes of water .. where seawater chemically reacts with rock (and where living creatures thrive)." Enceladus temperature ranges from -240 ° C to -128 ° C! Allooo! Where are those temperatures on Earth where "and where living creatures thrive"! No, they found the evidence. There is evidence of carbonates on Mars of the kind that can only form in the presence of water and CO2. "These kind of carbonates only form when there is a lot of water"
Actually I would go further and say that evidence is 'proof'. "A lack of hydrogen and hydrogen-based compounds is a very important fact for the atmosphere of Mars, but also for Mars in general. When certain smart people realize that there can be no water without hydrogen, maybe then will they stop writing about water on Mars and stop this massive, yet futile search for the fictional water. " "...Evidence for significant quantities of carbonate deposits on the surface began to increase in 2008 when the TEGA and WCL experiments on the 2007 Phoenix Mars lander found between 3–5wt% calcite (CaCO3) and an alkaline soil. In 2010 analyses by the Mars Exploration Rover Spirit, identified outcrops rich in magnesium-iron carbonate (16–34 wt%) in the Columbia Hills of Gusev crater,...."
Whoever said this has now got egg in his face as there is now ample evidence of the presence of the element (not the gas) hydrogen as well as there once being liquid water on Mars. There is also a LOT of frozen water on Mars. @humy, thanks for the input. If you didn't know already, you need to know that @wduckss is basically a loon, obsessed with his own hyper-simplified version of science, which deals with little more than a gut-feeling of his about temperatures and rotation of objects. His svemir... site is full of hopelessly inept mashups of pseudoscience claptrap. Avoid him if you can. Why is it that posters tend to choose monikers that reflect their intellect? Is this an indication that we know ourselves better than we think we do?